Conveyor tables: Verti-Lift has launched a full line of scissor lift tables, turntables, and tilt tables that are engineered to work with virtually any type of conveyors built in to optimize production, ergonomics, and operator safety. The company works with distributors and systems integrators to custom design, build, and integrate its tables with ball transfer conveyors, gravity roller conveyors, heavy-duty chain-driven live roller conveyors, and more. The tables are available in standard sizes and custom designs to meet specific customer requirements, with vertical travel of 24 to 60 inches and capacities from 2,000 to 6,000 pounds. Offered in single or tandem scissor lifts, with single, double, or custom widths in floor- or pit-mounted designs, Verti-Lift tables are ideal for assembly line or batch process production and assembly projects, the manufacturer says. Lifting device: Attco Inc. has introduced the "Sky Hook with Articulating Arm," a portable ergonomic lifting device designed to offer increased range of motion and full 360-degree rotation. 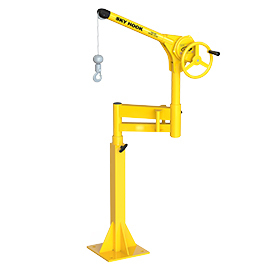 Like all Sky Hook industrial lifting devices, this model can lift up to 500 pounds in a variety of applications, the company says. While theSky Hookcan bemodified for customer needs and lifting requirements, the standard design consists of a few main elements. Its core design is its structure. Built with structural steel tubingand featuring 100-percent welds, it can withstand extreme industrial lifting abuse while weighing as little as 26 pounds, the company says. The Sky Hook also features a fully lubricated swivel hook capable of rotating 360 degrees with the touch of a finger, while supporting a 500-pound load. It has a swivel ergonomic handle and removable boom tube for easy storage. 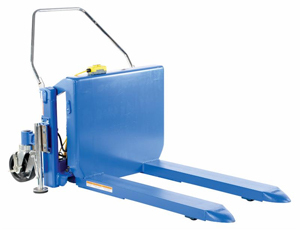 Heavy-duty tilters: Vestil, a manufacturer of material handling equipment, has introduced the heavy-duty Tilt Master series of material tilters, designed to lift and position filled tote boxes or baskets without the need of a fork truck or lift table. 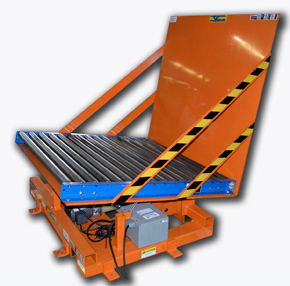 These 90-degree tilters will function as a transporter by moving completed products from workstation to workstation without waiting for a forklift. Feedback: What did you think of this article? We'd like to hear from you. DC VELOCITY is committed to accuracy and clarity in the delivery of important and useful logistics and supply chain news and information. If you find anything in DC VELOCITY you feel is inaccurate or warrants further explanation, please ?Subject=Feedback - : Spotlight on ... ergonomic equipment">contact Chief Editor David Maloney. All comments are eligible for publication in the letters section of DC VELOCITY magazine. Please include you name and the name of the company or organization your work for.